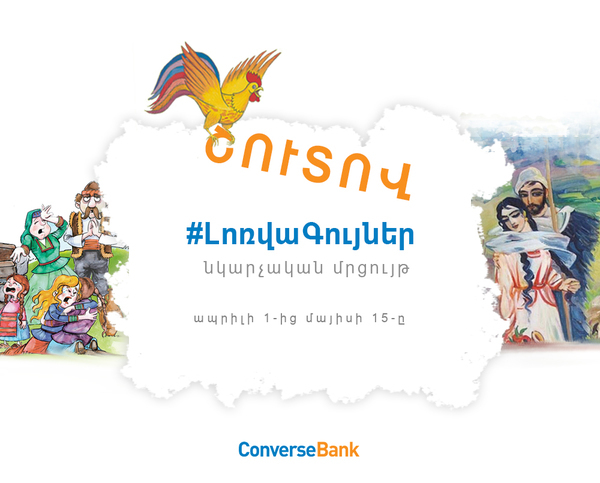 Converse Bank is starting a number of contests devoted to the great Armenians, whose jubilees are celebrated this year. This is another cultural initiative by Converse Bank aimed at increasing awareness of the cultural heritage left over by the great Armenian writers and raising interest towards their works. The first contest will be held from April 1 to May 15 and will be dedicated to the 150th anniversary of the great Armenian writer Hovhannes Tumanyan. Get gifts from Converse Bank. The contest is held in two stages: paintings will be accepted from April 1 to April 30. On May 1, the paintings will be posted on Converse Bank’s Facebook page, thus announcing the start of the selection stage. Some of the works will be displayed at the exhibition of paintings to be held in the Bank on the occasion of June 1. We expect the contest participants to attend the exhibition opening ceremony.